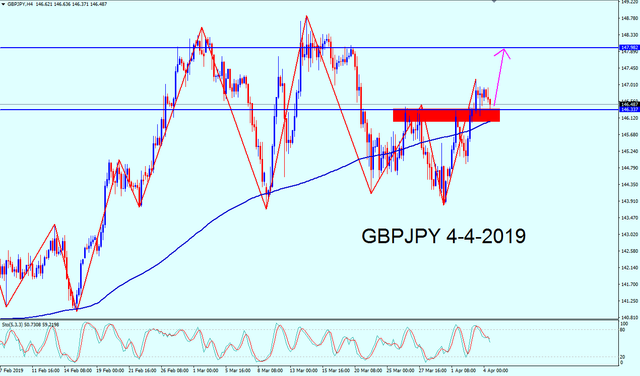 Good morning dear brothers and sisters i hope you all make good profit before end of the week , New technical analysis at GBPJPY 4-4-2019.
well, what i see on the 4 hours chart might not be all that good for a bullish move on this gbpjpy pair. now parabolic sar just turned bearish, commodity channels index, too. the only support for any bullish bias is the 200 moving average which rests at 146. a break of that level seems possible and hence the prospects of further decline in price. but if 146.00 offers the expected support, then you will definitely see this pair flying towards 147.50. Yes dear trader i am agree with your analysis that gbpjpy is having bullish pressure and also we can see zero cross over of MacD with very low pressure which giving us confidence that pair will break that level and move bullish towards the 147 level. Best of luck. Good morning every one i hope you all are fine and making good profit at this amazing beautiful trading day . update for GBBJPY , my stop loss has been reached yesterday because a strong moves at GBPJPY to down to make some re-test moves before end of the week and i think this pair will continue the bullish trend after that , hit my stop loss and run . new technical analysis for USDCAD , as i said i expect a weakness at USD at the next week so , i will sell USDCAD next week and i dont recommend to do that today because the movement at a lot of pairs will be unclear and better to enter next week , this pair at strong resistance level at 1.33674 and i expect we maybe see falling trend at this pair to touch the support level 1.33000 but if the 4 hour candle closed above 1.33900 i will not enter at this pair sell any more and will wait good chance to enter again at this pair buy , or sell if there is strong news . The following 6 users say Thank You to Legend Sniper for this useful post. The following 6 users say Thank You to ue2forex for this useful post. sorry to heard that your sl hit yesterday for bearish move of GBPJPY. We can see some bigger move happen for USDCAD today and that is the reason of NFP release and you will see some good happen several hours after that news release. This news is very much important for us and if we see that the difference of expectation and real data is huge then we can see some extreme move of USDCAD , obliviously CAD news are releasing positive most of the time and there is no such reason that CAD news will came negative. we have seen that the price is above 1.3300 fora long time and a strong support also seen there.I believe that price might break all the level today and it can go down below 1.3240. Dear friends i hope you are all right and wnjoying last working day of this week. I hope today we will receive bonus of this week. You make a good analysis, agree with you. In my point of view USD move in down trend. Today we need analysis of the market and wait for confirmation so we take a good profit in next week. Dear trader according to the technical analysis that pair is now moving towards the 1.3450 level. Because bearish pressure is going to be end now. And also today high impact news weakens the cad currency and strengthened the usd. The USD / CAD pair has retested to support the previously breached bullish channel and rebounded from there, in conjunction with negative signs from Stochastic while SMA 50 represents negative pressure against the price.